The 5th annual race was a great success despite ominous weather forecasts for strong winds and 70% chance of some type of precipitation. I had 137 runners entering up until the day before the race and 103 showed up. The weather was blustery at times, the sun even came out briefly, and the snow/rain/hail/sleet held off until about 5 hours into the event. Everyone returned safe and my stress level dropped a notch. 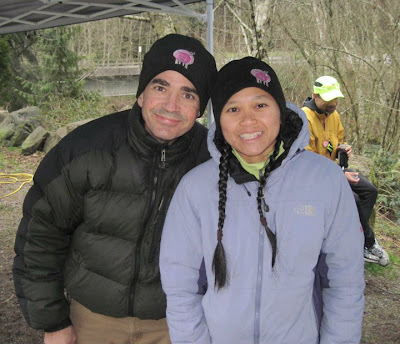 I had decided to offer beanies to race participants and they were a big hit. Seemed appropriate to give something that helped keep runners warm. Nice alternative to a T-shirt I was told. Each year, it gets harder and harder to put on my two races. For one thing, they are only a month apart. Updating race info is a drag. Seems like a simple thing to do, but I really don't spend that much time on the computer, and when I do, I consider it a waste of precious time that I could be doing something else. I changed jobs halfway through the year and my schedule became more hectic. I got a job closer to home but the patient load is heavier and my days (which went from 4 to 5 days a week) are longer. So trying to keep up my race and training schedule while putting on 2 races in the winter has been very challenging. Seeing people come to my race, I have to to say, is rewarding. I hope to be able to offer them for 10 years before handing them off to someone else. There were some glitches before race day, including one involving my beanies. I really liked the pig on the front but thought I had also asked for them to embroider "Pigtails Run 2010" on the back. Somewhere along the line, this was miscommunicated. I had considered just leaving it alone and accepting it but really wanted to have my logo. Unfortunately, I received my beanies a week before the race and did not have time to send them back to be fixed. My friend Mary Hanna contacted her friend for me in Maple Valley who did embroidery. She could not take on the job but did give me three places that might. I called them all the Monday of race week between my surgical cases and chose the least expensive one. They were all very busy with holiday orders but agreed to fit me in. My husband Ken was able to drop the beanies off while I was at work. They said they could have them done by Friday but actually finished them Wednesday and he picked them up for me while I was at work again. That was very helpful! I was pleased with they way they turned out and glad I decided to have it done despite the extra cost. The other thing that was challenging were my medals. I have had to come up with a different design each year for my homemade medals and it is getting harder. This year, I was able to find pink poker chips and thought it would be easy to make them in a short period of time. The first part was kinda easy. I just had to find a stamp on-line of a pig that was small enough to fit on the poker chip. That was a little challenging but I did find a cute flying pig that just barely fit. I got some permanent ink and wrote on the back "Pigtails 2010." The next part was harder than I thought it would be. I needed to drill a hole for a string. Ken did the first one to find the appropriate drill bit to use. Turned out it was not plastice all the way through. There was metal in the middle to give weight to the chips. So a 30 minute job to drill 130 holes in what I thought were plastic chips all the way through turned into 2-3 hours of drilling the holes and cleaning the metal shavings off. Ken did set a jig to make it easier to drill the whole in the same spot for each medal. Finally, I tied the strings on, at times with a headlamp since our power went out twice in the last 2 weeks. Brought back memories of my first year making medals under candlelight when a severe windstorm left us without power for 4-5 days. 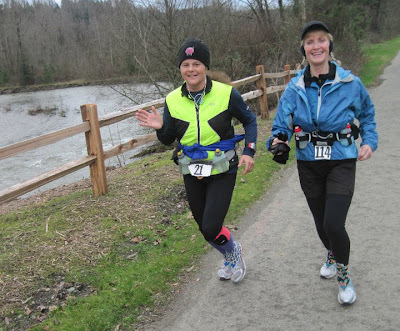 The last thing that made this race stressful was the high wind watch that was issued for the Cascade Foothills, which includes this race, where 30-40mph winds with gusts up to 65mph were expected to peak Friday night into Saturday morning. I sent out a frantic e-mail asking runners what they think I should do. Most runners wanted the race to happen since my reschedule dates were not appealing and they had other plans for the rest of the weekend. I decided to proceed with the race and hope for the best. I had taken Friday off to prepare for the race. Unfortunately, my office party was to start in the afternoon. I still had so much to do! 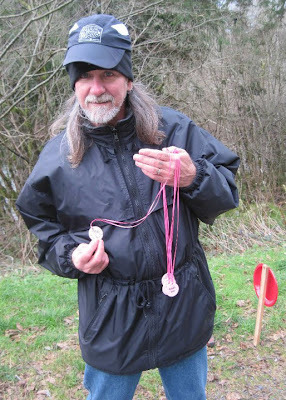 I finished making medals, loaded the car, returned e-mails (sorry to those whose messages went to my junk mail), marked the first turn around, and marked the aid stations. I got to the office party over 2 hours late but arrived in time to still eat and socialize. After getting home, I did some last minute loading of the car. I went to bed at a decent hour but the winds picked up and were howling all night, sending large branches crashing down on our house, truck, and property. No damage was noted on our buildings but Ken's Ford truck got a dent on the top of the cab. Needless to say, I did not get much sleep, worrying about possible damage and also about race day. Our power went out overnight and I did not get to send out one final message that my race was still on. We awoke at 4am. Ken made some coffee on the camp stove and we had oatmeal for breakfast. We headed out but had to stop 3 times to get out of our cars and pick up large branches in our driveway and the short gravel road that got us out to the main paved road. Then we just weaved back and forth avoiding branches without having to get out again. About half a mile from the start, a large tree spanned the road and there was no getting around it without breaking branches off the end so that we could squeeze by on the side. As we pulled into the parking lot, we were amazed to see that two of my wonderful volunteers had already arrived and pretty much set up. Jerry arrived at 4:30am and had set up his two tents. He had brought his camper, which served as a dry and very warm area for any cold bodies. It also acted as a buffer for the wind as well, which was still gusting strong enough that we grabbed onto the poles to keep it from shaking so much. Jerry had already pounded in some stakes to keep them from blowing away. Between Jerry and Bret, the tables were all set up, propane heaters were running, and propane lamps lit up the dark parking lot, making it look like a city. Ken and I were very impressed! The rest of my volunteers arrived and after unloading my stuff, we ran out of things to do. So Jess Mullen, Gwen Scott, Sharon Hendricks, and I went to make sure the cone that I had left the day before at the turnaround on the powerline trail was still there. We picked up branches off the trail on our way. The cone and my flour line were still there. Gwen placed a bunch of big branches across the road as one last assurance that runners would not run past this point. When we got back, runners were just arriving. 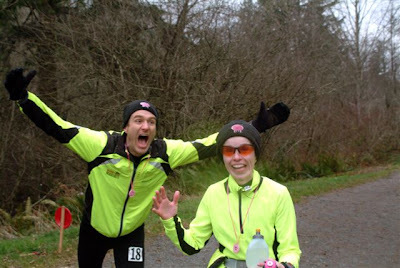 We checked runners in and handed out beanies. It was nice to have extra hands there to give out race bibs, receive food donations, and check off runners. Before I knew it, it was 10 til 8am. Anthony, who works for King County Parks arrived to check in on us. 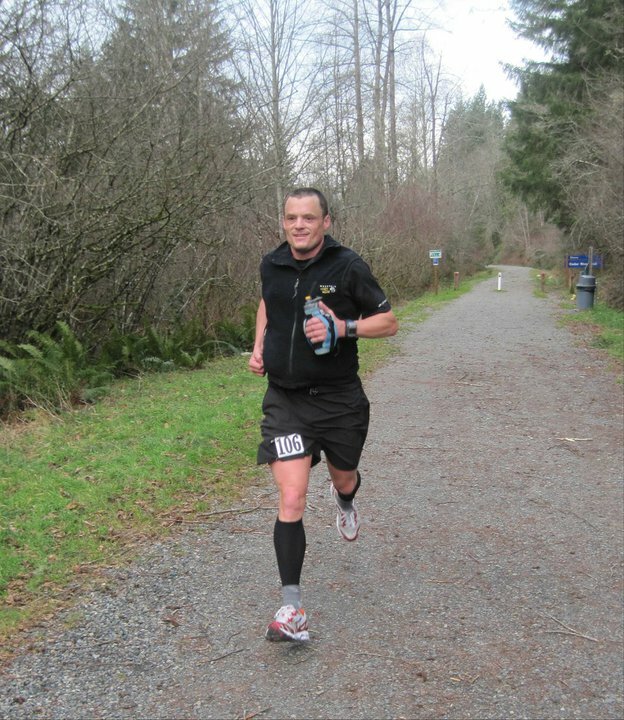 He had spent the previous day clearing the trail for the race (before the windstorm hit). Now there was another big mess. So he took off 10 minutes before the runners in attempts to clear the trail again. He did a great job according the runners. Trees that they had to hurdle or go around on the way out were cleared for the trip back. Thanks Anthony! We walked over to the power line trail and I gave my race briefing with my squeaky voice. I told them that it was 1/2 a mile on this trail before turning around and going back to the main trail for the rest of the race. Unfortunately, Paul Huynh didn't register this. He took off like a gazelle and ran past the cone, flour line, and around the branches over the road according to reports from other runners. He was apparently too far gone for anyone to call him back or chase after him. 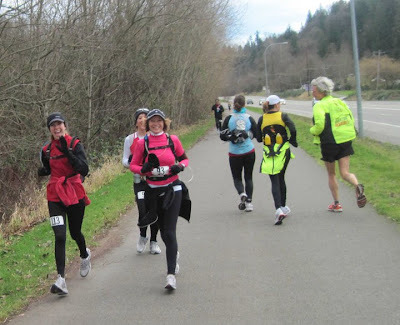 When the runners ran past the start, one of them told me that someone kept going and my stress meter went up. WHAT?! How can that be? If he was moving that fast, it would be hard to catch him now. More than 10 minutes had gone by. Gwen, who is very speedy herself, had running shoes on. She stripped off her down coat and went after him. But he was already long gone. We were hoping that he would turn around at some point and Gwen could run back with him. John Pearch, who is a phenomenal biker now (had been a phenomenal runner until his knee pulled him out of the elite level), was able to get his bike gear on quickly, now gave chase after both Paul and Gwen. Dave Murray and I got in my beamer and drove to the two spots where the power line trail crossed paths with residential roads. We got to the first intersection and saw Gwen heading back to the start alone and John continuing on. We kept driving to the next intersection and saw John coming towards us. Just about the same time, we saw Paul running towards us as well. He appeared to know where he was headed and we surmised that he had run into someone walking out on the powerline trail who told him how to get back on the Cedar River Trail. He didn't seem to want to stop to talk and kept going but took the wrong road. We all yelled out STOP! 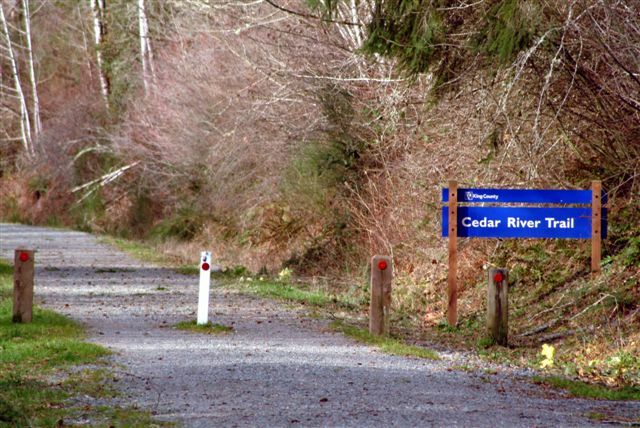 Dave and I ran back to the car and directed him to the hidden trail that leads back onto the Cedar River Trail. I am so glad that Dave was with me because I didn't know exactly where that was. A few of the lead runners had just gone by when we deposited Paul back onto the correct course. That was a crazy start! In actuality, the trail that Paul ran was hilly compared to the flat Cedar River trail and according to Dave, who runs this trail with his cross country kids, Paul had run at least an extra 1.5 miles before getting back on the Cedar River Trail. If he had won the race, I would have had a dilemma on my hands about who to name the winner since he went off course. I'm glad I didn't have to go there. Dave and I continued on to the main aid station and put up signs. Bret and Sharon were just receiving the front runners. Paul had caught and passed all the runners and kept moving along. He did not carry a water bottle or any food that we could see. They had a nice set up at this aid station. The tent had two walls. I brought the drop bags. 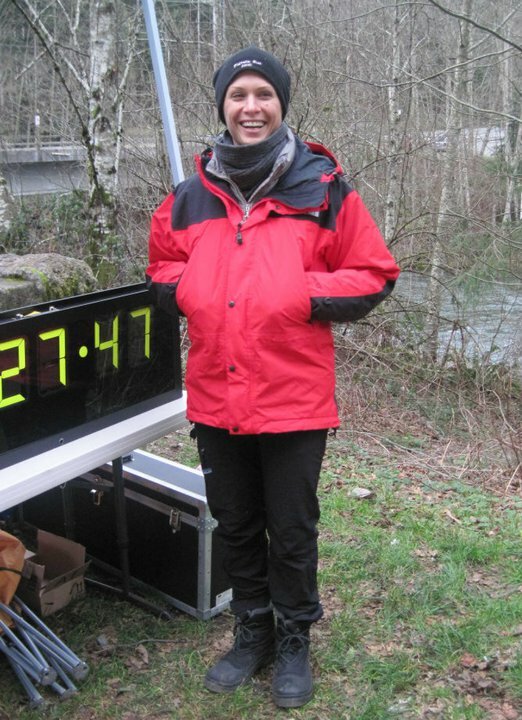 Sharon apparently had spent quite a bit of time clearing the trail where a big tree had fallen on the trail heading up towards Lake Wilderness where the 50K runners were going to do their final out and back. Bret and Sharon were doing a fine job so Dave and I moved along. We next set up the unmanned aid station at about 11 and 16 miles. We carried two 5 gallon jugs in and set them on crates. The water was nearly all gone so that tells me I need more next time. Of course, next time, there will probably be more than enough. That's how things go. I also left a bag of Snickers and Pay Day for anyone feeling particuarly hungry or bonked. Next we marked the turnaround with a cone, flour, and a sign that said "Pigtails Run." (Apparently, there was another race/run going on and there was a turnaround that was 12.9 miles for our race that some people took. For my race, you would have had to follow the trail under a road just before the turnaround). Dave and I knew that Paul would be coming so as we were driving on HWY 169, we kept an eye out for him. When we saw him, John was riding along. He said he was there to make sure he saw the turnaround. We told John what to look for. Finally, we marked the 50k turnaround. We stopped by Starbucks to get some coffee and sandwiches and headed back to the finish. Jess, Gwen, Ray, and Bryan retreated to Jerry's camper and told me that it was a luxury to have that there. While cozying up inside, they could hear the wind howling outside. I'm glad they had a place to get out of the wind other than their cars. 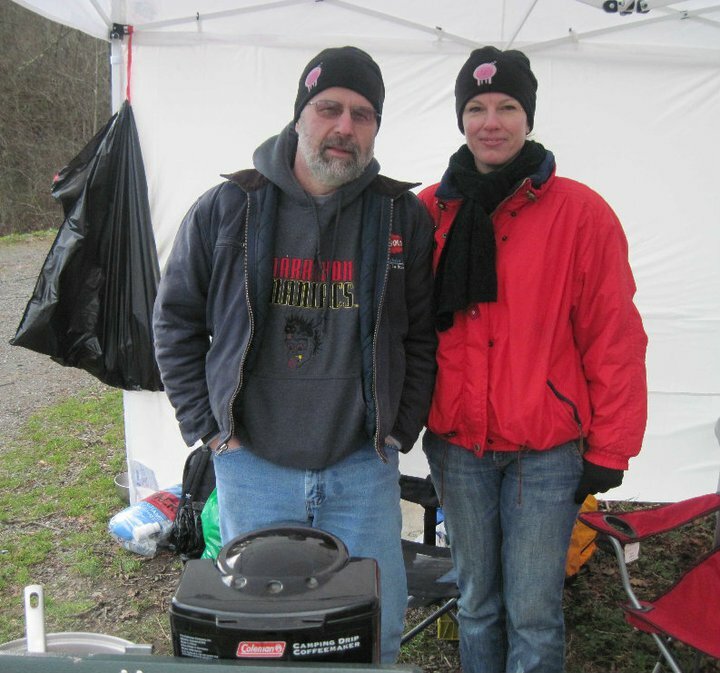 We had our coffee and lunch and started getting the soups and apple cider warmed up for the runners coming. Gwen had made vegan butternut squash soup and it was delicious! The weather continued to be ideal runner's weather. But I guess there was a decent headwind after the turnaround. 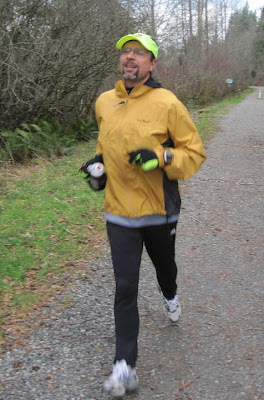 Finally, we saw a runner approaching and I knew right away it was Eric Sach, owner of The Balanced Athlete at the Renton Landing (nice plug). He had brought Clif Shot gels for the aid station. Thanks Eric! 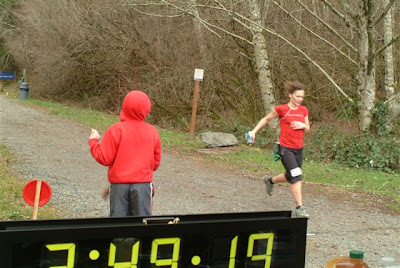 He looked totally unphased after running faster than his goal with a finishing time of 3:14:17. He was also first masters. Next in was Paul, who ran a speedy 3:20:10 for a 19-year-old! This kid has potential. Third male was Pedro Infante in 3:23:24. First woman was Christel Elliott in 3:49:10, her 1st win! She was followed by Sara Malcom in second with a time of 3:59:37. Sara had won the 50K last year. Third female was Heidi Perry in at 4:05:20. First female masters was Jill Langis in 4:25:00. In the 50K, Kevin Douglas and Hunter Maclean tied for first with a time of 4:13:24. Third overall and first male masters was Terry Sentinella, RD for the Skagit Valley Marathon, in 4:17:41. Genia Kacey took first for women in 4:28:32. She missed the course record of 4:26:00 by just over 2 minutes. 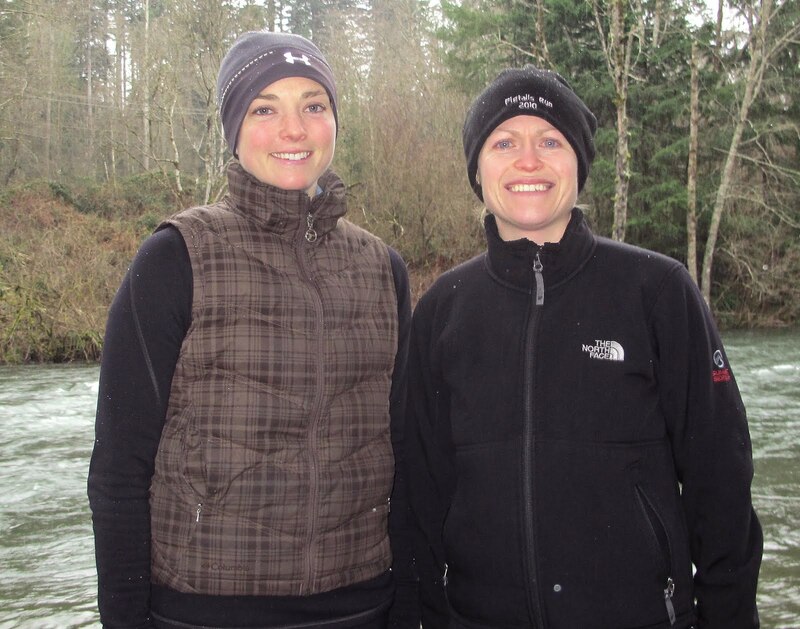 Second female was Candice Burt with 4:39:41 and Ashley Kuhlmann was third in 5:03:05. First female masters was Mary Hanna in 5:08:05. Ken went and got pizza for post race and the soups were very popular as well. Warm apple cider was consumed rapidly. Note to self-need more of that next year. The rain finally came which prompted tired legs to run for cover. Many hung around and socialized before leaving. That was nice. 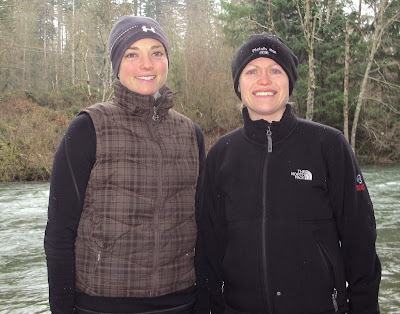 Jess and Gwen were lifesavers and recorded finisher's times and I kept the kitchen going. Ray handed out medals because I kept forgetting to. Thanks Ray! Bryan made the trek over to the main aid station and helped Bret until it closed down after the last runner came through for the last time. Bret had been there all day. They cleaned up and came back to the finish and continued to help there. Nearly all my volunteers stayed until just before the end. 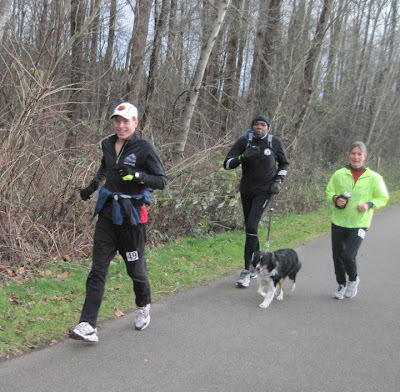 A few runners remained and Jerry and Bret stuck around until the last runner came through. Mary Hanna had gone home and showered but returned to help and see Bob Dolphin finish. She drove me out to the last 2 mile mark to make sure he had come through. We didn't see him coming so figured he was already on his way to the finish. We served him hot soup and cider at the end. His muscles were cramping but he was happy. To me, he was the toughest runner out there all day. I can't imagine running like he does at the age of 60 let alone 81! We finished packing everything into the cars. I finally said goodbye to everyone and breathed a big sigh of relief that it was over. But it doesn't end after the last runner comes through. I had to drive to the unmanned aid station and clear that as well as the turn around points. Not much to clean up but time consuming to drive to those locations. Mary was kind enough to pick up the cone and sign at the 50K turnaround since it is very near to where she lives. I took care of the rest. Came home and had to clean up the car and unload everything. Jerry had taken all the trash so I didn't have to deal with that. (He is a very handy guy to have!) I spent a lot of time cleaning the water and Gatorade jugs and washing pots with dried out soup. I dropped off the food donations during work the following week and wrote them a check for the amount that was donated on-line and on race day. They were again very appreciative since this time of year is sometimes lean for them. I was able to donate $400 in addition to the food. This was double the amount of the Lake Youngs race this year. You guys rock! Thanks again for coming out to play! Below are the final results. I can still make corrections if needed. This was Robert Lopez's 52nd Marathon or longer race of the year for 10 stars, the third time he has achieved 10 star status! This was Bob Dolphin's 478th Marathon or longer race. This was Andy Fritz's 220th race of any distance and the first time he has received a beanie. Come to think of it, I've done 270+ marathon or over races and have never gotten a beanie! 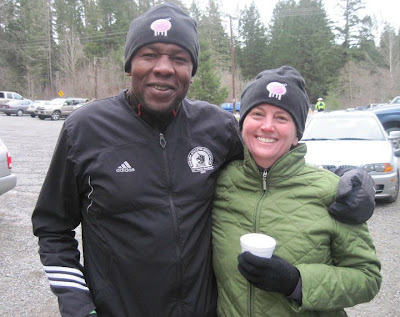 We had racers from these clubs: Marathon Maniacs, Skagit Runners, PSNS Fast Attacks, Seattle Running Club, Pat's Trail Nuts, Raise the Bar, Highline Community College, Eastside Runners, KBA Racing, and The Balanced Athlete. 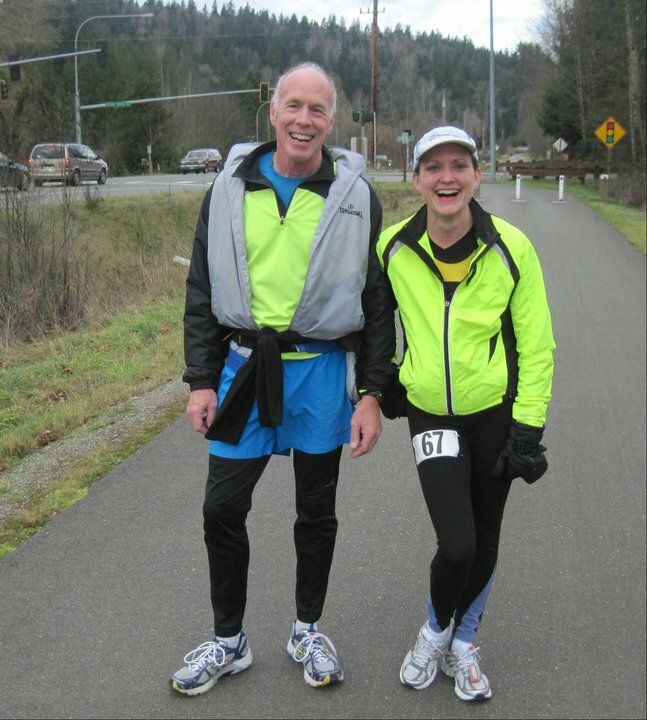 Mary Hanna and Bruce Hoff are the only runners to have completed all 5 Cedar River Runs. I'm hoping that they continue every year for 10 years to receive a 10 year jacket! A great recap of a great event. I had a wonderful time. The recovery has gone well, and I hope to be recharged for Lake Youngs.